Written By: Diane Ehrensaft, Ph.D.
No two children who bend the 'rules' of gender do so in quite the same way. Felicia threw away her frilly dresses at age three. Sam hid his interest in dolls and 'girl things' until high school-when he finally confided his desire to become Sammi. And seven-year-old Maggie, who sports a boys' basketball uniform and a long blond braid, identifies as 'a boy in the front, and a girl in the back.' But all gender-nonconforming children have one thing in common-they need support to thrive in a society that still subscribes to a binary system of gender. Dr. Diane Ehrensaft has worked with children like Felicia, Sam, and Maggie for over thirty years. 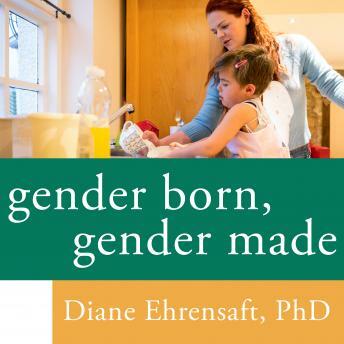 In Gender Born, Gender Made, she offers parents, clinicians, and educators guidance on both the philosophical dilemmas and the practical, daily concerns of working with children who don't fit a 'typical' gender mold. She debunks outmoded approaches to gender nonconformity that may actually do children harm. And she offers a new framework for helping each child become his or her own unique, most gender-authentic person.